Guess what I found hibernating under my kitchen extension? I've posted a few articles about Brooklyn wildlife here over the years. Now I apparently have one of them as a roomate. Last week I broke a tile on my bathroom vanity and decided that today was a good day to fix it. I keep my spare tiles in a barely heated shed under my kitchen extension. As soon as I opened the door to the shed and the gamey smell hit my nose I knew that something wild was living in there. I assumed it was a feral cat or two until I saw a bunch of straw nesting material falling out of a large bag of potting soil. Cats don't do that so I picked up a lawn torch, gently opened the bag and look what I found. 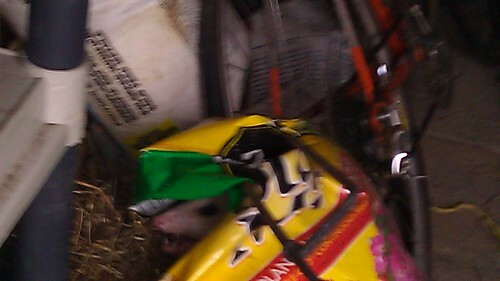 Petey Possum! I wasn't all that surprised by this because I see possums late at night at least once a week. The dogs have become so accustomed to them that I can tell from their reaction when they've picked up the scent a hundred feet away. They're fairly aromatic animals. Not sure what to do here. On the one hand, I'm not going to do what one of my neighbors did and kill him. Any wild animal that manages to survive on the streets of Brooklyn has my profound respect. My concern with the nesting material however is that this is really Penelope Possum and that she's about to bring more of these critters into the world. Whatever, I need to replace the missing brick in the side of the extension in the spring. Local lore says that opossums took a foothold in Brooklyn about seven years ago when some genius at one of the Brooklyn community boards thought they would be an excellent solution to keeping the rat population in check. They're very versatile animals and aren't shy about killing prey, including rats. Problem is, that same versatility means that they're happy to live on the same garbage as rats. So the rats survived, the possums survived and here we are. Possums are fearsome looking animals but they're actually pretty passive towards larger animals, hence the "playing possum" thing. I rummaged around in the extension for about five minutes looking for my tile and its only reaction was an occasional hiss.